Right then, let's get started with the most awkward of all blogposts - the perfume review - and an attempt to describe fragrances while sounding as pretentious and as pseudo-intellectual as possible. In one sentence: salty green opener that dries down to reveal a floral base. I'd be very surprised if this was a commercial winner. It's green-meets-floral-meets-coffee - a heady mix that sometimes appeals and other times fails to fit. Upon first spray it's sharply green, enveloping the wearer in a salty fern scent. If that sounds less than appealing you'll be pleased to know that it dries down to something more feminine and floral. That marine tone remains but it's softened by apple blossom and then, over time, settles into a quiet mix on the skin. I haven't tried anything quite like it. Jo Malone Sage and Sea Salt, which in concept sounds similar, is far woodier and masculine. This is more of a hybrid and the coffee base note makes it a little warmer. I like it but it's weirdness wouldn't convince me to tell you all to run out and buy it for yourself. In one sentence: Intoxicating and addictive rose meets cedar fragrance that stays true to the original. Whereas the full bodied parfum is housed within a dinky white cube, this cheaper, lighter eau de toilette is neatly packaged in black. I own both and can tell you that this one doesn't stray too far from the original - at all. I would almost say that they are identical, both in terms of scent and longevity. Sure, its a little less creamy and a little sharper in terms of blend but I still enjoy it just as much. It's Bulgarian rose and woody base makes it total Rich Bird territory. and there is something strangely addictive about wearing it. What first starts as a casual friendship rapidly descents into total intoxication and right now I am wearing it every day. If you only take one thing away from this post just heed my advice and try this in the near future in either this or the original parfum format. Expect something quite creamy, grown up and sensual…oo err! In one sentence: fruits, florals and an amber musk mixed together to create a light and playful scent. I went to a press launch for the promotion of the new fragrance trio from this well established British brand and was given the opportunity to select the perfume that appealed to me the most. I plumped for Coeur de Jardin. This is bergamot, lemon, pear, peach, rose, jasmine, tuberouse, patchouli and amber - amongst other ingredients that I can no longer be bothered to list - designed to facilitate the wearer's ability to reminisce about hazy, sunny afternoons spent in the English countryside. I do love the romance that underpins the inspiration behind this and I also appreciate the fact that it strongly reminds me of one of my most cherished fragrances of all time - the long since discontinued Matthew Williamson perfume that I repurchased near 5 times. It has that same heady floral impact with white florals and amber lingering and giving that sense of warmth. If you can find a Miller Harris stockist near you I would recommend trying this as well as the classic Fleur Oriental. In one sentence: delicate and fragile light cherry blossom fragrance that refreshes and fails to linger. First of all did you see that installation in the Jo Malone store for the cherry blossom promotion? Genius - Link! Sometimes the simplest ideas are the most effective. This is an extremely delicate floral. In the mix is cherry blossom, bergamot, mandarin and a subtle hint of musk. It's all very pleasant and light - a perfume for those who want to be a little less obvious and a little more romantic - making it the exemplary Spring perfume. However, it's subtlety is probably it's downfall for me. After I spray it on the skin I get a brief moment of refreshment and then it's business as usual. I can't hate on anything Jo Malone though. I love the boutique merchandising style, the experience of buying, the packaging and some of my favourite candles and perfumes come from the brand. If I could repurchase this limited edition fragrance though it wouldn't be top of my list. Fact. So after all that it turns out that the cheapest fragrance is my favourite :) The Narciso is out this month so keep your eyes open and your noses ready! What perfume are you wearing lately? Good luck Demi! :) Sounds lovely - a perfect summer fragrance. They all sound so lovely. I may have to pick one of these up, lovely photos by the way. Oooooh the Miller Harris scent sounds most appealing to me! Lovely descriptions! ps. I'm all over that Byredo Blanche at the moment, I'm addicted to the stuff! I think you'd like it too. 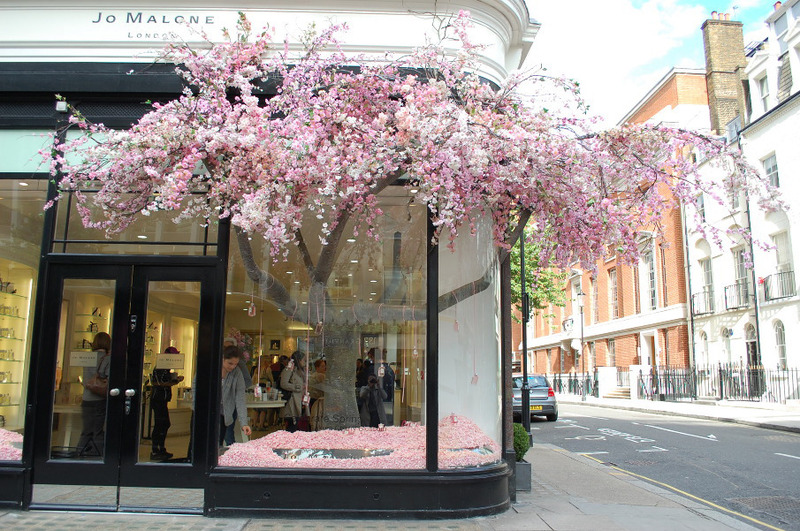 The Jo Malone cherry blossom installation is SO beautiful! My favorite fragrances are fresh citrus-y ones like Jo Malone Lime Basil & Mandarin and Acqua di Parma. I got a sample of that Narciso eau de toilette last week (remember my ranty snap?)! Now I'm excited to try it! There is nothing remotely awkward about the way you describe scents, in fact, you may just be the best at doing such a thing. Narciso eau de toilette sounds incredible, I need to stay away from it, I already have too much perfume as it is. One sniff won't hurt though will it? I hate how much of a Jo Malone groupie I seem to be...but I just cant get enough! I'm still obsessed with Elizabeth and James Nirvana Black, and I'm itching to try Jo Malones wood sage and sea salt! Great descriptions of all of these fragrances! Thanks for sharing. I love floral scents for the spring/summer. Givenchy Angue ou Demon, a favorite for more than two years. This is far, far better than how I describe a fragrance - well, it smells good...no I can't describe any note but I like it. :) I love Jo Malone and I thought about the Sakura but I like my fragrance to hang around all day (better to smell that than the latest fermented scent in the NYC subway!). The Miller Harris one sounds right up my street! I've been wearing Fico di Amalfi by Acqua Di Parma a lot lately, it's such a lovely summer fragrance that's seriously underrated! I love the Narciso Rodriguez one as well, it smells sooo addicting!